Bait and switch is a fraudulent activity whereby a company advertises goods at an incredibly low price with the aim of substituting them with inferior or pricier alternatives at the time of purchaseSale and Purchase AgreementThe Sale and Purchase Agreement (SPA) represents the outcome of key commercial and pricing negotiations. In essence, it sets out the agreed elements of the deal, includes a number of important protections to all the parties involved and provides the legal framework to complete the sale of a property.. Just like the maggot at the end of a fishing rod, companies use lower pricing to lure customers to their offers. However, instead of getting the item initially advertised, the company attempts to sell the consumer an entirely different product. In many instances, the item the retailer is trying to sell is either of inferior quality or more expensive than the advertised product. Either way, it is an act of fraud that is punishable in a court of law. The tablet or advertised product is out of stock although there are other options for a higher price. For instance, the vendor may try and sell the customer a much smaller tablet that is inferior in every aspect and one priced at $100. Having gone all the way to the store, a majority of consumers often end up buying the substituteSubstitute ProductsSubstitute products offer consumers variety when making purchase decisions by providing equally good alternatives, thus increasing utility. However, from a company's perspective, substitute products create a rivalry. As a result, businesses may incur high marketing and promotional costs when competing for market to avoid leaving the store disappointed and empty-handed. The tablet is available, but it costs more than the advertised price. In an attempt to persuade the customer to purchase, the vendor will come up with excuses. The buyer will be told that the available product offers better features and works better than the initial product in the ad, or that the advertised product was only available to the first ten customers. Buyers should be wary of sellers that employ the bait-and-switch tactics. However, they should also be capable of identifying situations that are not bait and switch in nature. Pricing errors are one of the most common complaints that customers falsely classify as bait and switch. A pricing error is a genuine mistake made by a vendor who lists the wrong product price. Fortunately, the situation is easy to figure out. Imagine a brand new 60-inch LCD TV that goes for $50. No retailer would ever sell a television set for that price. In such a situation, a customer may be able to purchase the product at the insane deal. However, once the seller discovers his mistake, he is likely to follow up the matter by sending an email and canceling the order. He may also issue a refund if the customer already paid for the item. Another instance where buyers cry “bait-and-switch” when the tactic doesn’t really apply is when there are limited quantities of a particular product. A retail storeBusiness SegmentA business segment is a subsection of a company’s overall area of operation in which there is an established separate product line. A business segment can be identified by the product or services provided or by geographical locations that the company operates in. Senior management typically divides the overall company owner could offer a product at a discount but also state that the offer would be available to the first ten or fifteen customers. Afterward, the product will be sold at its usual price. The event cannot be classified as a bait-and-switch strategy as the seller initially gave clear details regarding the offer. A vendor who makes inquiries about the customer’s payment details too early. If the online retailer starts asking for payment details even before the customer can clarify specifications of the product, it can be a sign that the seller is not genuine. A company that advertises products or services at highly discounted prices without any strings attached. It’s important for a buyer to read the fine print before deciding to pay for such products. A seller who gives excuses for the advertised products running out of stock or being more expensive than as advertised. A seller who claims that the advertised product is merely an element of a much larger product or service and that one must purchase the complete package. Poor communication – If an individual is planning to buy a highly discounted product, he shouldn’t shy away from making inquiries regarding the product. The buyer should then assess just how truthfully the seller is responding to his inquiries. If the seller is reluctant or ignores the buyer’s concerns, then the buyer should give it a second thought. 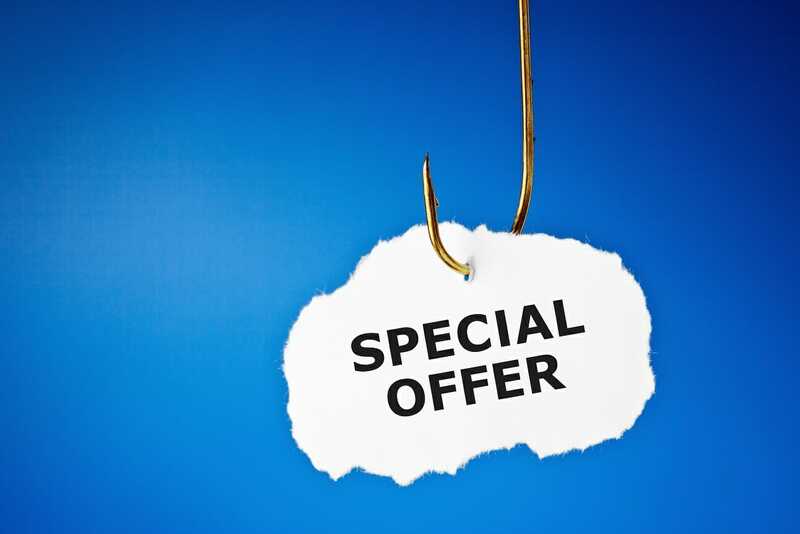 Using a bait-and-switch strategy to lure buyers into deals is not only wrong but also unlawful. Consumers need to be wary of deals that seem too good to be true. If an individual falls prey to such companies, he has a right to report the offending party to the relevant authority.